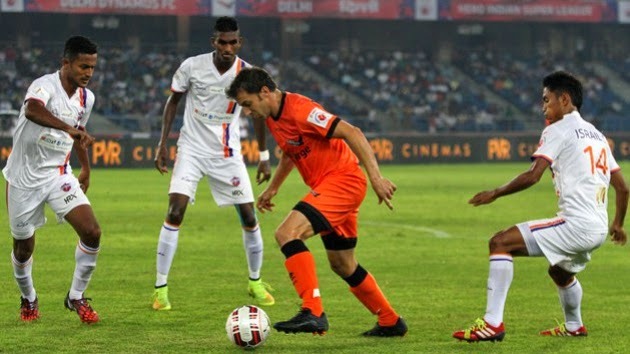 Hosts Delhi Dynamos FC were held to a goalless draw by FC Pune City in the third game of the Hero Indian Super League at the Jawaharlal Nehru Stadium tonight. This is the first match in the competition to end in a draw. Although Delhi Dynamos were the better side and enjoyed greater possession and chances, Pune City goalkeeper Emanuele Belardi kept them at bay with some fine saves. Even the introduction of the peerless Alessandro Del Piero failed to break the deadlock in favour of the hosts though the Italian legend sparkled in bits and pieces after he came on in the 37th minute.